SALES OF Diageo's Scotch whisky brands continued to grow worldwide, according to their figures for the last six months of 2016, writes Leon Kuebler for WhiskyInvestDirect. The interim results posted by Diageo, which cover the six months ended 31 December 2016, show that net sales of Scotch grew by 6% on the same period of 2015. Volume sales were also up by 4% year-on-year. Diageo is the company with the largest market share of the Scotch whisky industry, accounting for an estimated 36% of all Scotch sales worldwide. Scotch is the most significant category in Diageo's portfolio, representing over a quarter of the company's net sales worldwide. Year-on-year, Scotch outperformed both Vodka and beer, the second- and third-largest respective categories in Diageo's portfolio, in 2016. The ongoing popularity of whisky also benefitted net sales of North American whisk(e)y, which grew at the even faster rate of 15%, albeit with sales occurring principally in North America. In the last six months of 2016, the net sales of most of Diageo's major Scotch whisky brands grew on the same period of the previous year. Diageo's biggest brand of Scotch whisky is Johnnie Walker, which accounts for over 1 in every 5 bottles of all Scotch sold worldwide. 2016 H2 saw Johnnie Walker perform well, with growth posted in every region. Net sales of Johnnie Walker grew at 8% in the United States, 17% in Australia and 19% in China. Net sales of Diageo's other major brands (Black and White, Buchanan's, J&B and Old Parr) also grew over the same period. The only significant brand of Scotch to see sales fall was Windsor, which is mainly sold in South Korea, and experienced a double-digit decline in sales on H2 2015. Sales of Diageo's malt brands, which represent a small section of their overall Scotch portfolio, also increased by 3% year-on-year. As the company with the largest market share of the Scotch industry, the performance of Diageo's brands of Scotch whisky is good indicator as to the strength of the industry overall. Between July and September 2016, the value of Scotch exports rose 4% compared to the previous year. Although the full 2016 export figures for the whole Scotch whisky industry have not yet been published, Diageo's sales figures for July-December suggest that Scotch has continued to perform well in the second half of the year. The performance of Diageo's Scotch brands in Latin America and Spain stand out. In the first half of 2016, total shipments of Scotch to these regions showed signs of growth after a challenging couple of years. 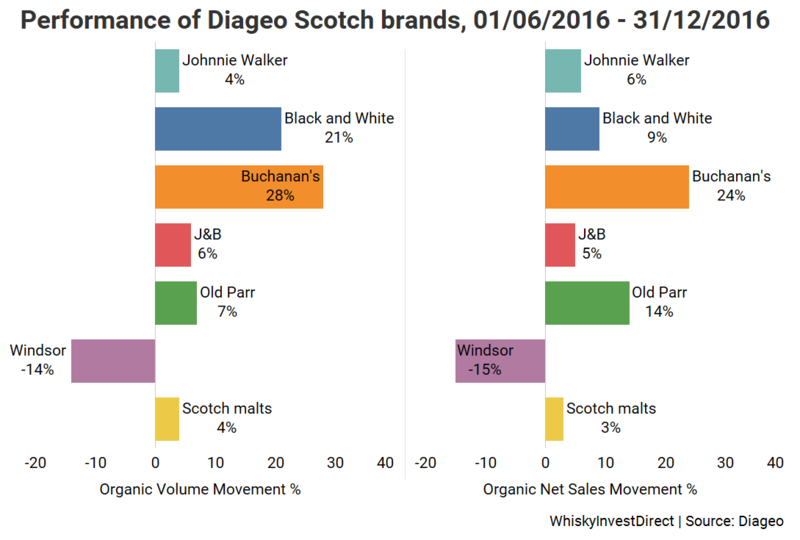 The latest results from Diageo suggest that Scotch is continuing to perform better in these markets. Black and White, Buchanan's and Old Parr are mainly exported to Latin America, while J&B is predominantly sold in Southern Europe. Most significantly, net sales of J&B and Johnnie Walker grew 'in the high teens' in Spain, the fifth-largest market for Scotch by value in the world. The interim results for Pernod Ricard, which holds the largest share of the Scotch whisky market after Diageo, are expected to be announced in February.